Autonomous vehicles not the cure all for congestion – our new report finds. We often get caught up in the excitement about autonomous vehicles, but we need to remain objective and consider what Autonomous Vehicles (AVs) should mean for transport and land use planning. Without applying this 'critical lens', and planning for the most appropriate application of autonomous and electric vehicle technologies, we may even risk further entrenching an over-reliance on the private vehicle to meet our mobility needs - which is completely at cross-purposes with sustainable transport planning principles. This is the key finding of the Autonomous Vehicles Research Report launched today by transport consultancy MRCagney. The research, conducted in Auckland, advises on how to prepare for an autonomous future. While the report was produced in a New Zealand context, the findings are lessons for all cities. Reduced off-street parking requirements (but not short-stay on-street parking). Increased pressure on meeting infrastructure requirements due to urban sprawl with longer commutes becoming more convenient in AVs, due to the freedom for passengers to do other 'things' while a 'chauffeur' takes care of the driving. So, how can we best embrace the opportunities of an autonomous vehicle future, while avoiding the potential pitfalls? AV Public transit. There are great possibilities present when autonomous or semi-autonomous vehicles are used for public transit. Availing of these technologies, PT services can be provided at a significant discount, with savings passed on to passengers or reinvested to improve overall service levels. AVs can, and should, be used to supplement - NOT replace - public transport (especially for last mile access), and extend personal on-demand choices to avoid increased congestion. “Our modelling shows that without public transport, even with full adoption of autonomous vehicles, cities will be heavily congested because of already constricted corridors into cities, the limit capacity of the road networks, and growing populations,” he said. The report predicts that it will take until 2055 for AV technology to become standard in private cars. AVs capable of Levels' 1 and 2 (semi-automation) are already available in the market place. Level 3 AVs (limited self-driving automation with all safety-critical functions automated, and surrounding conditions monitored) are now emerging for application on our city streets. Governments must enable AV advancement via regulation and providing certainty to the market. Parking infrastructure must be updated to enable AV. Public transport connections with autonomous car share vehicles must be facilitated. AV should be trialled in PT vehicles. Road infrastructure should be upgraded to be AV compliant. Connective vehicle/infrastructure/services technologies should be invested in to improve road safety and the overall travel experience for all. 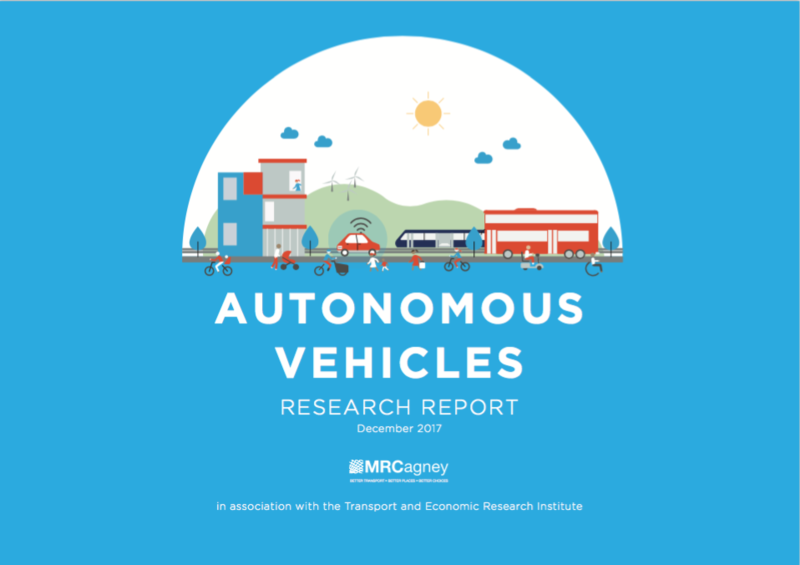 MRCagney’s report describes a future where autonomous vehicles are introduced slowly - commencing with ride-share services and public transport trials - before becoming more widely adopted for car share and transit. It also highlights key steps to get there. MRCagney acknowledges this process could take several years due to the slow rate of vehicle turnover, the high cost of the new technology, and legislative and technological barriers.